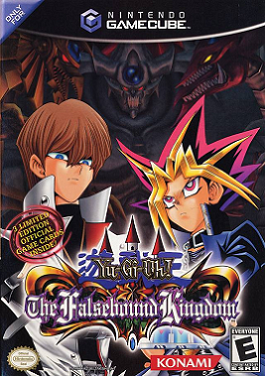 The Falsebound Kingdom was released in November 2003 (NA) on the Nintendo GameCube. Instead of being a card-game, it is a turn-based RPG at combat with the movement and maneuverability of an RTS (real-time strategy) game. This game has received universally negative reviews from critics. Zoa. LV7 DARK Fiend-type Normal-Monster. 2600 ATK and 1900 DEF. Pretty much a standard beater, with decent stats for LV7 but with so many large vanilla monsters out there, this card doesn't really provide anything unique either. May find some use for it's attribute/type/level but otherwise it's generic. Metalzoa. 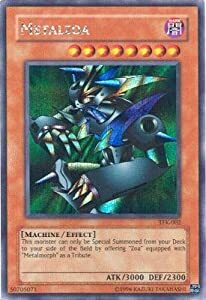 LV8 DARK Machine-type. Effect-Monster. 3000 ATK and 2300 DEF. 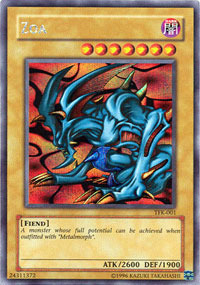 Can only be Special Summoned (from the deck) by tributing Zoa equipped with Metalmorph. Ridiculously high cost / requirement just to get out a slightly stronger monster. Any 3000 ATK monster that can be summoned regularly beats this. Horrible card. Goblin Fan. Continuous Trap. LV2 or lower Flip Summoned monsters are destroyed and their effects are negated. LV2 or lower monsters being Flip Summoned rarely ever happens. If anything most nasty flip-effect monsters are LV3. 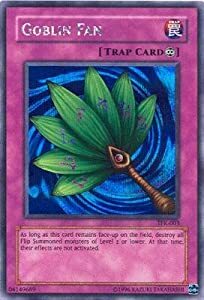 This card was never good, still isn't and probably won't ever be. Way too restrictive to ever work. Falsebound Kingdom is a game with some interesting ideas that are, however, rarely executed well. 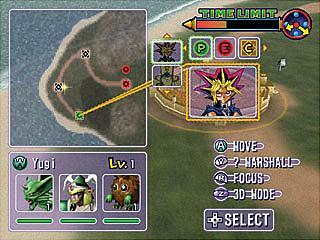 For example, the story (set in Ancient Egypt) is a two-campaign narrative with Yugi protecting his land as pharaoh and Kaiba being part of a resistance group. However, the story doesn't really go anywhere interesting and it's mostly flat dialogue. 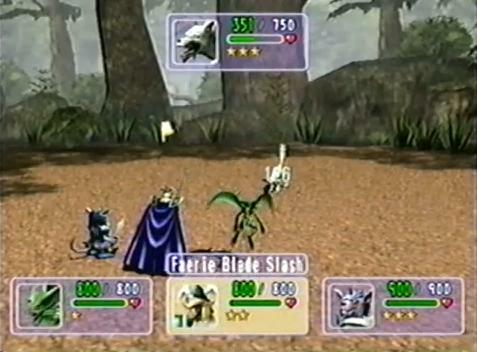 It doesn't help that most of the visuals in the game consist of muddy N64-grade textures that would've been marginally acceptable in 1997 – not in 2003 - though the monsters themselves often look vibrant. You move around the characters field of open plains and protective forts. You wait for minutes for the slow-as-molasses characters to move until they are in direct combat with the enemy and then you fight them. The combat is like the turn-based RPG elements of Pokémon, except each monster you have only has one attack ability rather than several among dozens of them like Pokémon does. So, you basically mash the "A" button to victory because the only other option is for your monster to Defend and there's no logical benefit from that. Despite menus full of stats, this game does not have much depth. There's really no strategy or creativity in assembling a strong army of monsters. The monsters don't work together in any way. You just keep the monsters with the highest stats and abandon the weaker ones as you progress and gain more monsters. The RTS elements are shallow too. There is no farming or resource management. There are no complex commanding strategies. 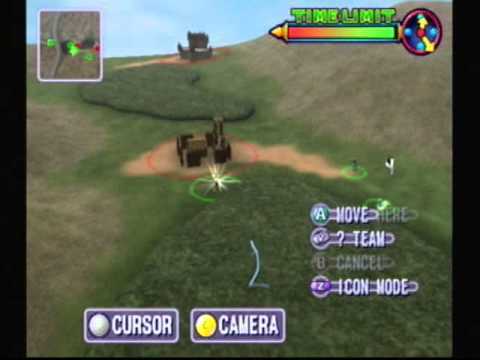 You move throughout the field in a linear fashion, capturing fort after fort as you mash through battle after battle. It's a little rewarding to clear a stage, gain monsters and gain some progress in the story. Then, you remember the long mind-numbingly boring monotonous routine you had to go through in order to advance. And all of a sudden, the game feels as unappealing as ever. Pojo himself wrote a quick summary of this game in a children's book: "This game stinks. Gamecube owners should be crying." I concur. But dang, it's a shame that this could've been a good game if it were made by a better studio. Or, a somewhat passable one at least, if it were made in the 90's.